In previous articles I discussed the four different kinds of horse ulcers, and the reasons why they develop. In this month’s newsletter I discuss holistic treatments for each type of ulcer, since no single treatment works for every kind of ulcer. Since ulcers in different part of the digestive tract occur for different reasons, applying the same treatment to all ulcers is likely to produce a less than satisfactory results. Here is a short summary of how I treat each different kind of ulcer. Treating horse ulcers in the stomach is all about soothing and protecting the stomach lining, while stimulating healing as quickly as possible. To soothe and protect the stomach lining, I like to use high-quality aloe vera juice, slippery elm, and green clay. I also like to feed high-quality blue-green algae to stimulate rapid healing of the stomach lining. I use two ounces of an aloe vera gel two to three times a day mixed with two teaspoons of ground slippery elm bark. I mix these together in a 60cc syringe and give it orally five to ten minutes before feeding. The aloe vera aids in healing of the stomach lining and the slippery elm is a mucilaginous herb which protects and soothes the stomach lining allowing it to heal. I also give blue green algae at the rate of one to three tablespoons a day to provide additional nutrition and help heal the ulcers. 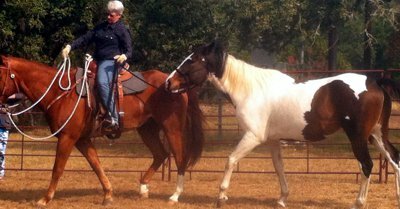 With duodenal ulcers, my goal is to get the horse into a relaxed state so that proper digestion can take place. To that end, I feed both pre- and probiotics because probiotics (the friendly bacteria that live in the horse’s intestine) produce B vitamins, which help the horse to relax. Prebiotics both nourish the friendly bacteria and convert an acidic environment into an alkaline one. Effective products in the probiotic category include Fastrack, KLPP, and New Earth Bluegreen Algae (which also contain blue-green algae). I also like to feed additional digestive enzymes to support digestion. SUCCEED has some effect, probably because it contains both beta glucan, which speeds the healing of ulcers, and theanine, which aids in relaxation. Another product that works well in healing horse ulcers in the duodenum is the KAM Ulcer Formula, which contains a combination of aloe, slippery elm, and other demulcents. As with stomach ulcers, healing horse ulcers in the colon is all about soothing and healing the intestinal lining. SUCCEED is particularly effective here, since it coats the intestinal wall and prevents irritation. The KAM Ulcer Formula and blue-green algae also stimulate healing. All of the methods mentioned above will contribute greatly to healing a horse’s ulcer. In addition to these specific supplements, horses with ulcers also benefit greatly from bodywork that releases adhesions and adjusts spinal subluxations, both of which can cause ulcers. Osteopaths, chiropractors, and body workers such as Equine Touch practitioners can all assist in this area. In addition, examining your horse’s life and removing possible causes of stress, such as excessive use of NSAIDs or a career for which he is ill-suited, can go a long way toward preventing horse ulcers. I hope your eyes aren’t crossed after reading about the different holistic treatments for each type of horse ulcer. It’s important to treat your horse’s ulcer appropriately otherwise you waste your money and your horse’s ulcer won’t heal. Luckily, most horses respond well to the appropriate treatment so once you determine what kind of ulcer your horse has, you just have to get the right supplements to nourish and heal his gut. For one-stop online shopping for all of the ulcer treatment products mentioned in this newsletter, just visit the Holistic Horsekeeping online store.